The DivX codec are pretty simple and easy to use. Its immense popularity is because of its ability of compress large video files into a relative smaller size without affecting its visual quality. However, a divx video is not going to play on your Android or iOS smartphones. If you are looking forward to enjoying the DivX videos on your phone ,then you would be required to choose a DivX converter to convert your DivX files to MP4 format firstly. Keep reading this article to find out about the easiest way to convert DivX to MP4 on Windows, Mac, and online. Converting a DivX file to MP4 format is pretty easy. All you need to do is find a good desktop converter which would help you convert your DivX file to the MP4 format. There are many online converters which would help you with this task, but most of them are lacking in useful features. 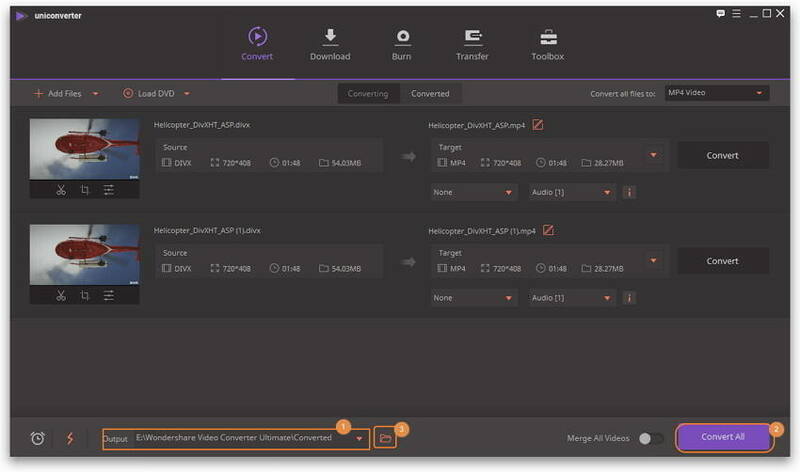 Wondershare UniConverter (originally Wondershare Video Converter Ultimate) is one such DivX converter which would not only help you convert any video file to other format but also allow you to edit, download, burn, enhance and organize the video files. Wondershare UniConverter (originally Wondershare Video Converter Ultimate) is a Windows only software which you can try out for free. You need to follow the given steps to convert your DivX to MP4 on Wondershare UniConverter (originally Wondershare Video Converter Ultimate). 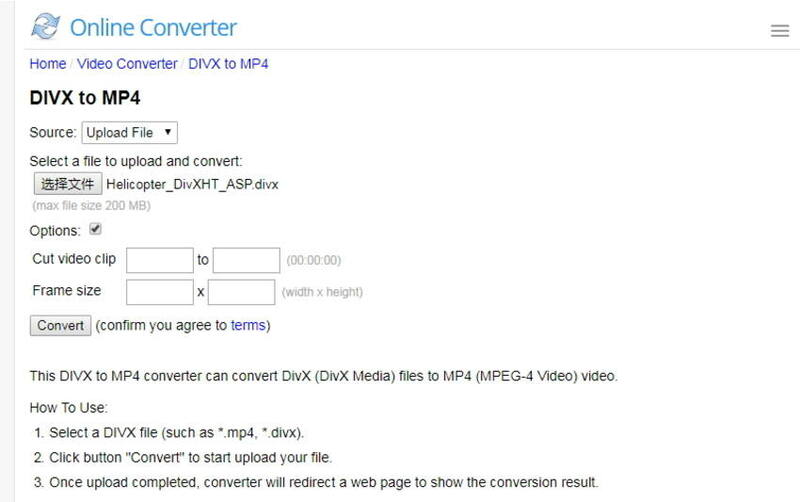 Directly convert DivX to MP4, AVI, MKV, MOV and other 1000 formats. convert DivX videos to MP4 at 30X faster than the common converters. Convert your movies to good quality files which are playable on all your favorite devices like iPhone, iPad, Android, tablets, Kindle Fire, Xbox, PlayStation etc. Burn DivX to DVD disk to play with your DVD player. Transfer converted DivX videos to iPhone/Android phone or other mobile devices easily. Let us now take a quick look at how you can convert your DivX to the MP4 format on Windows. And for Mac users, you can follow the similar steps to fulfill the Mac DivX to MP4 conversion as well. Step 1 Open the Divx video converter and import DivX file(s). YThe first thing you need to do is download a Windows video conversion software like the Wondershare UniConverter (originally Wondershare Video Converter Ultimate) and install it on your computer. By default, you will enter the Convert section after opening it. Click Add Files to import the DivX file to the converter. Or use drop and drag feature to add the file. Here you're enabled to import files in batch. Step 2 Choose the output format as MP4. Click the down arrow icon to open the output format list, tab the Video tab and choose MP4 from the left side bar, and then select the video resolution in the right to confirm the output format. Also, you're optional to click Edit icon to set the output parameters. Step 3 Start converting DivX to MP4 on Windows. Before the conversion, you can set the output destination folder firstly, and then click Convert All button to start converting DivX files to MP4. After a while, you can located the converted DivX files in .mp4 format by tapping the Output icon. Step 1: Open https://www.onlineconverter.com/divx-to-mp4 and upload your DivX file. Step 2: Edit your video if you want by checking the "Options" (Optional). Step 3: Click "Convert" button and wait for your converted file to be downloaded in the MP4 format. Pricing You can try out for free or download the full version for $59.95 This is a freeware. This is an online free converter which has a premium plan. 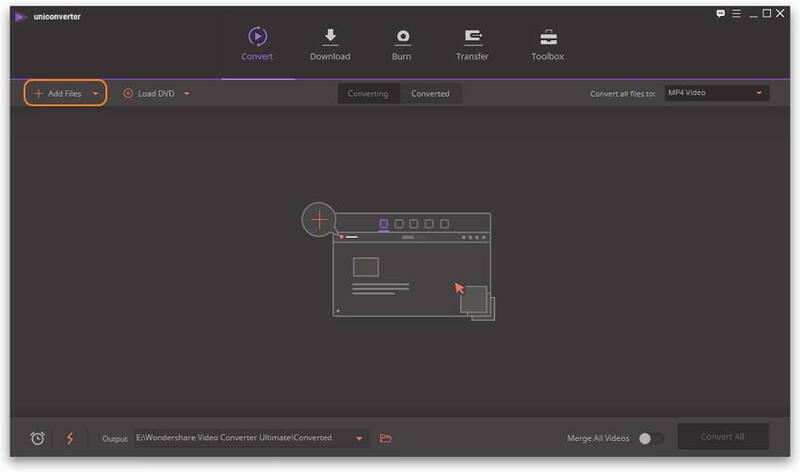 It's very clear that if you're one-time user, you can use the free solutions mentioned above, but you're a regular user to convert videos to other formats, we recommend you to download Wondershare UniConverter (originally Wondershare Video Converter Ultimate) for better experience. Download it to have a free try now!